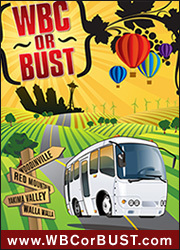 WBC-or-Bust: Wine Predator Throws Hat Into Ring for Trip to WA Wine Country! Compete in the WBC-or-BUST contest. No –Write! Write about Washington wines! Live it up! Be driven around to various top-notch wineries from Seattle to Walla Walla! Be wined AND dined! Stay in a way cool B&B along the way! See the badge there on the sidebar? That means I’m official! Only if you sign up and follow these “Rules & Guidelines”! TO ENTER If you don’t already have one, create a free WineCHATr.com blogger account. Choose a “WBC-or-BUST” badge/banner from your WineCHATr.com account manager. Add the badge source code to your blog website, so that it is visible from any page. Warning: This is a pain in the neck. But if I can do it, you can do it. They have a few badges to choose from. I like this one the best. TO QUALIFY Once the WBC-or-BUST badge has been properly added to your blog website, simply blog about Washington wine throughout the span of the contest. No less than one Washington wine post must be published to remain eligible. I don’t think this one will count, do you? The huh? The final four winners will be selected at random out of all qualifying participants? Random? Can you see me scratching my head? Maybe 2 random and 2 because the writing overall was good or the person showed lots of potential or had proven her worth by blogging like a mad dog at other conferences? Oh and FYI This post has 700 words if we count the title, well over the required number of 150 words per post. Since I tend to write posts of 750-1000 words, do you think I should break them into parts in order to be more competitive? Or add lots of extra words to my sentences? * Your blog has to have been started before the end of October 2009 (no problem there–I started this blog August 2008 and started psoting regularly October 2008; my main blog, Art Predator, I started November 2007). Below are more details about this amazing opportunity. Check it out and you’ll see why I want to be on that bus or bust! Arrive to Walla Walla in style just in time for the WBC with a deeper understanding of Washington and its thriving wine industry. So here goes! Until this contest ends at the end of April, there will definitely be a Washington Wine slant to this blog. It’s gonna be a blast! And maybe I’ll get to blast off in June to my next wine adventure–in Washington! Now to find my notes from the WA wines I tasted at WBC…they’re here somewhere!